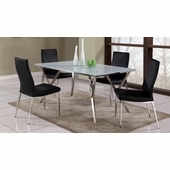 This contemporary, rectangular dining set adds elegance to any eating area. 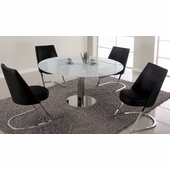 Featuring 1/2" thick tempered glass, the table top is supported by a double tulip, pedestal base and circular floor plate, finished in polished stainless steel. The corresponding chairs, fully assembled, white faux leather chairs adds to the stylish environment. 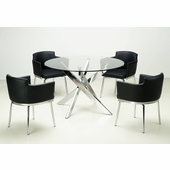 Sturdy, polished, stainless steel legs support the comfortably cushioned seat and contoured back. 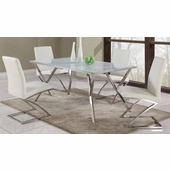 The backrest also features a stainless steel accent border at the top to compliment the table base and bring the look together.